Winter, the season of snow falls and icy breath, means less going outside and longer periods spent indoors. It is particularly difficult to leave the house in Shimane, with its many rainy and snowy days throughout the season. However, there are some things that give us hope during the coldest part of the year; winter sports, onsens, and seasonal foods. Especially warm foods such as nabe, oden, and other broth-based meals that are designed to warm us up. Add some hot Japanese sake into the mix and suddenly those long winter nights stop seeming so bad. Shimane, blessed with a fertile landscape, is rich with clean water and delicious rice and it is these high quality ingredients that help to ensure the region produces delicious sake. Today, I visited one of Shimane’s numerous sake breweries. Called ‘Yoshida Shuzou’, they make a popular brand of sake called ‘Gassan’. I first tried it some time ago and instantly fell in love and have recommended it to many friends and acquaintances since, so I was excited to visit the actual brewery for myself. Yoshida Shuzou, said to have been brewing sake since 1826, has a near-two-hundred year distinguished history as a brewery. Today, there are about ten people carrying on the impressive legacy, through manufacturing and managing the shop. 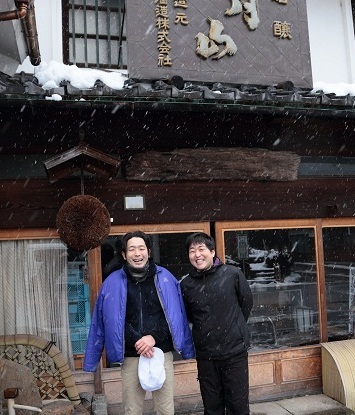 Waiting to greet us were Executive Director Mr. Yoshida and Master Brewer Mr. Adachi, both younger than I had been expecting. Despite the cold weather they explained to me about the Gassan brand with a youthful passion. They were most interested in talking about the ingredients, specifically the water and the rice. Generally, Japanese sake is made from about 80% water. 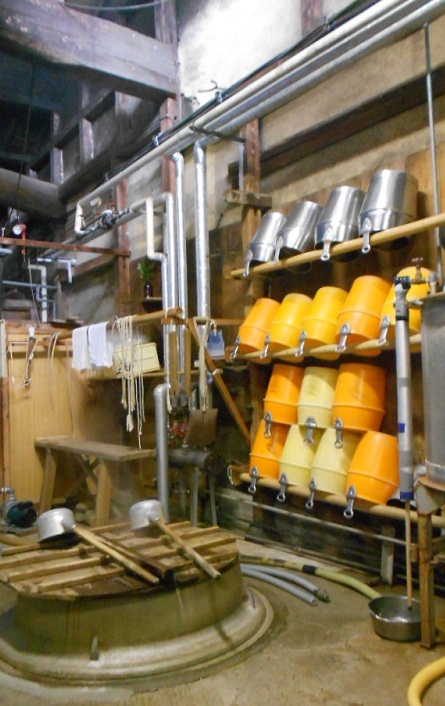 The water used for Gassan sake comes from a well located in the mountains about one kilometer away from the brewery. The water is of such high quality it is also commonly used for tea. It is ‘soft water’ with a low level of minerals. 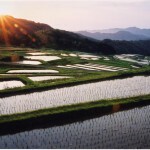 The rice, meanwhile, is grown on Shimane’s clean water and is perfect for sake brewing. It is about 1.3 times longer and more expensive than standard koshihikari rice. They use about one hundred tons of the rice per year, but much of it must be polished to remove the rough, bitter taste of the exterior shell. For example, to make Daiginjo sake, say you begin with one ton of unpolished rice, just one hundred and seventy-five kilograms will left for use in the actual brewing process after polishing is complete. The parts that remain unused are recycled as food for farm animals or as fertilizer. Hearing this, I felt that sake was more of a luxury product than I had thought. Japanese sake is made without additives, relying on a simultaneous saccharification and fermentation process. To avoid any other bacteria growing during the brewing process, the majority of sake is brewed in the cold winter months. Before coming, we were warned not to eat natto (fermented soy beans), because the bacteria found in it can kill the ones necessary to the fermentation process of the sake. We were guided through the entire brewery, including the rice-milling room, the yeast room, the rice malt room, the fermentation tanks, the filtration room, and the storage facility. The room that impressed me most, though, was definitely the room with the fermentation tanks. 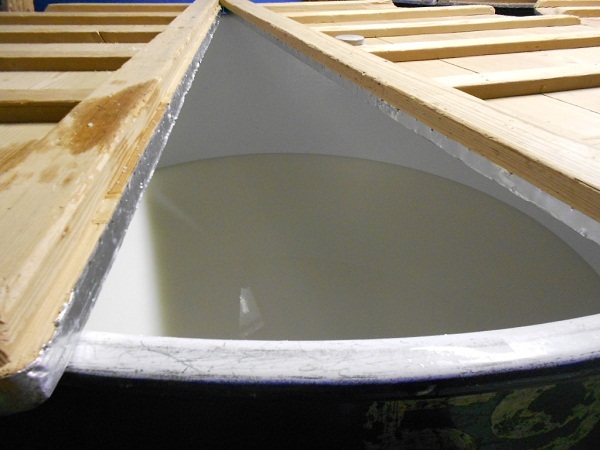 The large tanks are made with enamel and were filled with in-progress sake. 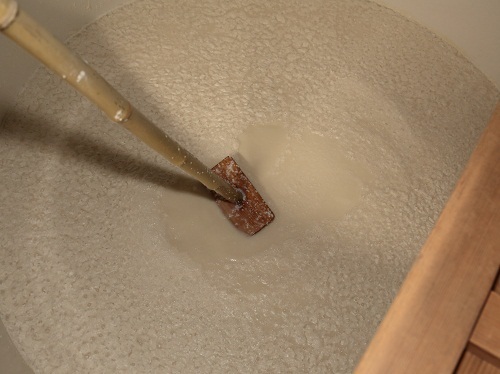 The process involves mixing and separating the rice, water, and malt not once, but three times and then letting the mixture ferment for fifteen days. Once that time has passed, a sweet, fragrant smell emits from the tanks. I took a peek inside the tanks and the mixture resembled the Korean milk-colored alcoholic beverage makgeolli. The bubbling mixture signaled that it was well on its way to complete fermentation. Once the fermenting is completed, the filtration process begins. 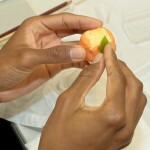 Of course, at this point, it is important to conduct taste tests! 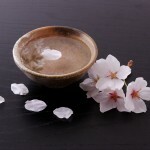 The birth of new sake must be carefully watched over by the eyes, the ears, and the mouth. At present, the Yoshida Shuzou produces fourteen different types of sake, but the taste can vary through the years within these types by ingredient quality and popular taste. It is a fluid process. Even the taste of one bottle might soften over time. Mr. Adachi tells me that Gassan tastes its best right at the end of Summer after it has been fermented. Japanese sake; born of water, rice, malt, the power of yeast, and humans. Who knew that from such simple ingredients could come so many flavors and fragrances. Today, I was reintroduced to the true depth of the world of sake and for that I am grateful. 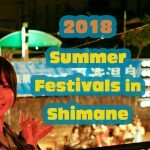 This report has been published in a magazine SHIMANEAN, which was made by CIR(Coordinator for International Relations) living in Shimane, to provide information on Shimane to the world. *Please note that during busy periods, they may be unable to meet all requests. They start making sake with newly cropped rice from the end of the autumn.